SHOWERS were spread across the Southern Downs at the weekend with most of it soaking into the thirsty soil and very little making it into our dams. Soil moisture modelling by the Bureau of Meteorology showed no runoff on any of the Downs country. Only the mountain areas around Killarney had runoff water and that was only about 0.01-0.03mm. The BOM modelling puts this down to a lack of soil moisture before the showers. The bureau measures soil moisture with the wettest rating reserved for the kind of mud that would bog a tractor. Soil moisture to a depth of 1m to 6m in a large swathe of country on the eastern flank of Warwick through Allora, Freestone, Yangan to Stanthorpe is in the lowest 1 percentile. This means that over the past 100 years, only one percent of soil moisture levels have been lower. 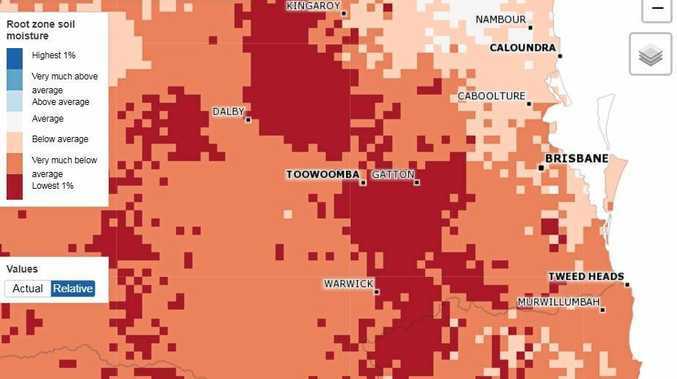 The western portion of the Southern Downs is marginally better, sitting at well below a long-term average of the 5-20 percentile. The bureau uses information about soil types, topography and rainfall measurements to estimate how much moisture is underground and it is calculated across the 5km by 5km blocks in the above graphics. SunWater said Leslie Dam's capacity increased by 43ML to 10,381ML from Friday noon to Monday noon. It is currently at 9.77 per cent capacity.